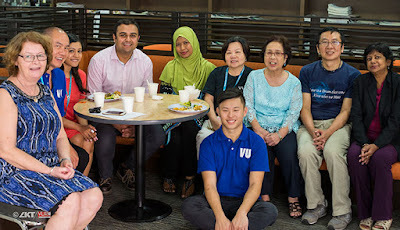 Friday, 22 January –that was the date Khurram scheduled with Ms Irene Teoh, Deputy Head, AUP, for his visit. 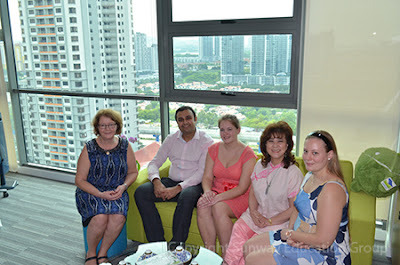 Ms Teoh had arranged a special programme for Khurram and his family. 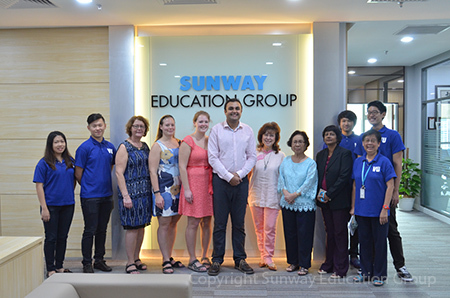 At 11.45 am, Khurram met with Dr Elizabeth Lee, Senior Executive Director, Sunway Education Group, who is always interested in catching up with Sunway Alumni. 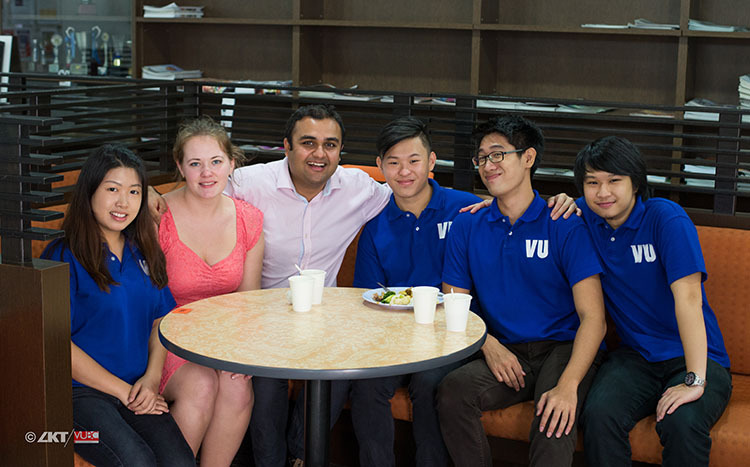 Dr Lee addressed him “My VU Prince” (Khurram was voted Mr VU in 2005). This was followed by a short tour of the campus. Lim Shu Ling, Jason Tan, Carson Leong and James Puah from the Victoria University Business Club were on hand to conduct the tour. Chin Seng Choy from Public Relations was our official photographer for Khurram’s visit. The special spots chosen were the Library, the FIFA field, Graduate Centre and of course down Memory Lane to where Khurram could show his wife where his lectures and tutorials were held. At Lecture Theatre 7, Khurram recounted this “naughty” incident. He was totally exhausted during Mr Jason Cheok ’s lecture, so he lay flat out on a bench way up at the back of the lecture theatre. There were some visiting guests that day and a photo session had been scheduled. Mr Jason was puzzled why they were not standing at the appropriate section. Since everyone kept quiet, Mr Jason climbed up and of course found out the reason – Khurram was fast asleep on that bench. Everyone had a good laugh! At the Jeffrey Cheah Hall (previously MPH), Khurram recollected this comical experience. “James Bond – Casino Royale” was showing, but that same morning, he was writing his Marketing Research exam paper. He completed his paper half an hour before time and immediately dashed off to be on time for “Casino Royale”. Ms Moy Tow Yoon was stunned when he told her why he had to rush off. Nevertheless, he scored a Distinction for the paper! Lunch at 12.30pm provided an opportunity for Khurram to meet with some of the lecturers who had taught him – Ms Haslinda Mohd Yunus, Ms Jennifer Choong, Mr Jason Cheok and Mr Tee Chwee Kiat. In her speech, Ms Teoh said Khurram had always been ready and willing to assist when needed. During orientations and when there were visitors, Khurram readily volunteered his services. So this time there was a reversal of roles with Khurram as the visitor. Ms Greeja De Silva, Head, AUP, commented that although she did not teach Khurram who had an exemption from the Management and Organisational Behaviour unit, she remembered him because he had always made it a point to pleasantly greet her each time he met her along the corridors. 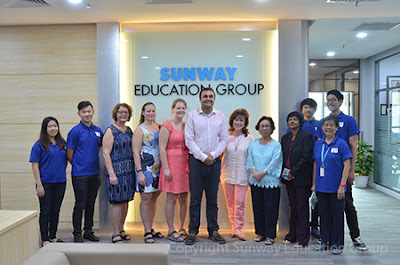 She also expressed a hope that Khurram would not wait another 9 years to visit Sunway again! What gifts did we have for Khurram? The special AUP blazer, VU T-shirt with the 20th Anniversary logo, the 20th Anniversary crystal paper weight, a copy of the “VU Voices” and “Sunway-VU 20 Years” – souvenirs that link Khurram to his ‘second home”. Khurram said he valued that this visit had given him more than the ten minutes that he had dreamt about. He had wished so much to come back to Malaysia,that once he dreamt that he was in the bus going to work. However instead of taking him to his office, it took him to Sunway Pyramid! Khurram hopes to be back again and on his next visit with a Baby or perhaps Babies !! !